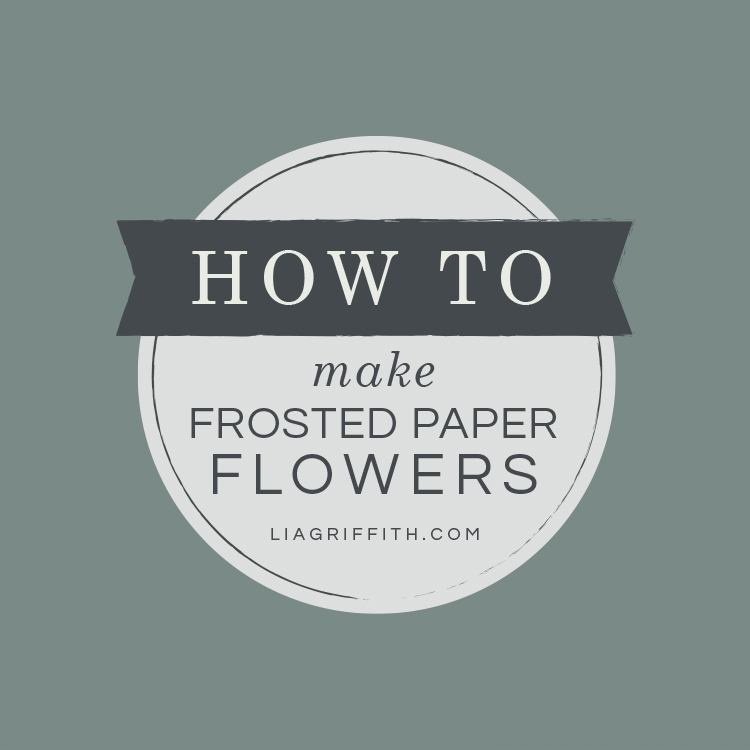 Learn How to Make Frosted Paper Flowers Like a Pro! Learn how to make frosted paper flowers! Frosted paper flowers can be gorgeous, inspiring, and a little intimidating. The truth is you don’t have to be a professional to craft like one! We’ve outlined all of the tips you need below to flourish as a paper florist. In this article we’ll teach you how to get the most out of your templates, choose the best paper, and finish your flowers for the ultimate swoon-worthy blooms. The best part? All of this is waaay easier than you think! So flush that fear, grab your scissors and let your creativity blossom! Before you begin crafting your frosted paper flowers, first you will have to download our templates. To make this first step easier we have included some tips and tricks below to help you get the most out of your templates. Most of our downloads come in two types of files: SVG cut files and PDFs. SVG cut files are for those crafters who own a cutting machine. If you’d like to learn the ins and outs of SVGs, you can read our blogpost here on how to use SVG cut files. If you are cutting by hand using a PDF, we also have some handy dandy tips for you! Use Cardstock Paper – Our first tip is to print out your PDF templates on cardstock paper. The thicker paper will make it easier for you to trace or cut around your template. Save Your Templates for Later – Once you’ve printed out your template we recommend placing it in an envelope with the name of the flower written on it so you can save your template for later use. This is something we do in our studio. It helps us stay organized and get the most out of our PDF downloads! Direct Printing – You can also print the pattern directly onto your text-weight frosted paper instead of using cardstock if you’d like. Frosted text-weight paper is our absolute go to for paper flower crafting. Why? Not only does this paper have a gorgeous sheen to add a bit of sparkle, but it also adds a lifelike dimension to our blooms. Text-weight paper is far easier to sculpt than cardstock. Plus text-weight paper holds its shape better and is more forgiving. Cardstock tends to show curl lines and will draw attention to any imperfections in your craft. That’s why text-weight paper is perfect for beginner and advanced paper florists alike. Making your flowers look professional is incredibly easy! Here are some of our favorite tricks that we use in our studio to level up our floral game. PanPastels are one of our favorite tools to use to add color to our frosted paper flowers. In fact we have our very own designer kit of PanPastels that we use in our studio. You can find them here. When using this technique be sure to apply the color to your flowers before curling or assembling them. We recommend using a matte spray finish to seal in the color once you’ve applied it so that it stays in place. No one wants flat flowers! One way we add depth and dimension to our frosted paper blooms is curling. With the help of Fiskars we have created our very own curling tool designed to give you the best results on whatever type of paper you are working with. You can also use scissors to curl your paper but this technique often leaves unsightly lines. When curling your frosted paper think of curling ribbon using scissors and your thumb. Be sure to be gentle. If you pull too hard your paper will rip. The best way to get the feel for curling is to practice on a few scraps of paper first. Once you get the hang of it you’ll find it’s super simple and makes a huge difference in your paper flower projects! We recommend using 18 – 24 gauge cloth or paper covered floral wire to finish your flowers. This floral wire allows you to bend and arrange your flowers in a natural way. To shorten the stems, find yourself a good pair of pliers / wire cutters. At the end we recommend wrapping your wire in floral tape to give your stems that real look and feel. Depending on the type of flower and occasion you can get fancy with your floral tape colors. Go for the classic green or branch out with brown, cream or gold. Onto the very last step… arranging. In our studio we use rice or foam balls at the bottom of our vases to make our flowers stay in place. Foam is especially helpful if you are arranging your flowers in a pot. This material lets you vary the height of each flower and get creative with your presentation. For tips on how to arrange your paper flower bouquets, watch our detailed video here. Share what you’ve been up to by using #MadeWithLia. We love seeing the creative magic you conjure so strut your stuff and flaunt those project photos for all to see — your creativity is our biggest inspiration! We’re here to help you explore your creativity with daily inspiration, downloadable cut files and printable templates that make your craft life easier. We believe in the power of creativity to nurture the soul and to empower us. Our designs are created with simplicity in mind and we always strive to provide you with the highest quality DIYs. Where to find frosted text weight paper? what settings do you use for 180 crepe paper on the cricut maker.I tried chiffon and didn’t get a great result. We use the “crepe paper” setting for extra fine, and “cotton” for heavier and double-sided crepe.